Jim Posey lowers a caboose last summer onto the waiting trucks. Museum Board Vice-President Jerry Davis displays some original Nelsonville Star Brick the museum intends to use to pave its walkways. Volunteers prepare the gravel bed for rails in 2017. The Gallipolis Railroad Freight Station Museum sits quietly under snow as the sun sets on town in January. Jim Posey lowers a caboose last summer onto the waiting trucks. Gallipolis Freight Station Museum Board President Jim Love (left) adjusts a railroad tie as Thomas Cook of Feed Stop volunteers his time as he places rails for a track taken off the back of a semi with a fork lift in February of 2017. The Gallipolis Railroad Freight Station Museum sits quietly under snow as the sun sets on town in January. Gallipolis Freight Station Museum Board President Jim Love (left) adjusts a railroad tie as Thomas Cook of Feed Stop volunteers his time as he places rails for a track taken off the back of a semi with a fork lift in February of 2017. Volunteers prepare the gravel bed for rails in 2017. Museum Board Vice-President Jerry Davis displays some original Nelsonville Star Brick the museum intends to use to pave its walkways. 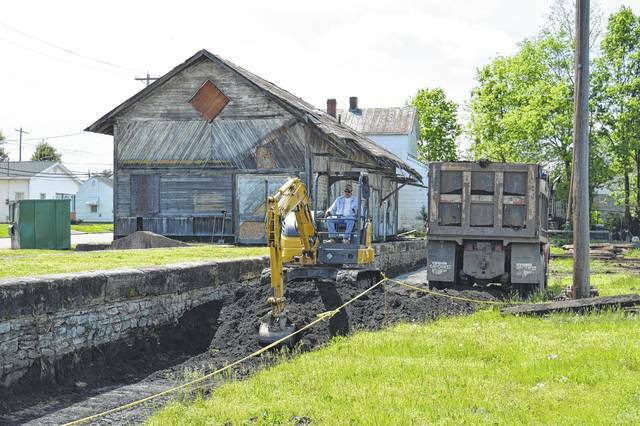 A rail is pulled from a beneath a gravel lot at the corner of Third Avenue and Sycamore Street in Gallipolis. 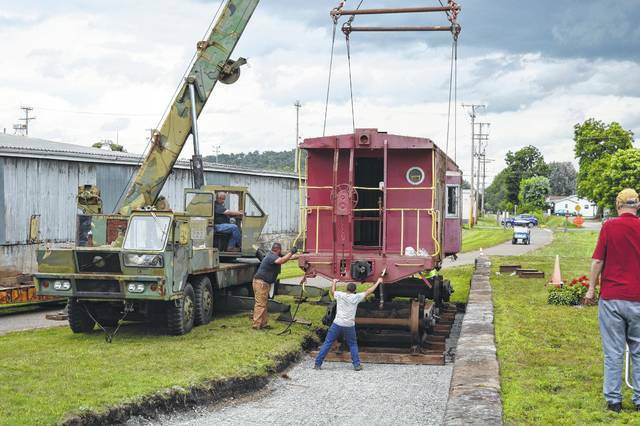 GALLIPOLIS — The Gallipolis Railroad Freight Station Museum is looking forward to what appears to be a promising year as the museum’s board attempts to acquire a passenger car, utilize potential $125,000 in state funding and rebuild the museum’s interior. “We’re going to work on the inside of the building and that will include heating and cooling, insulation and we’ve got to redo the restrooms and make them handicap accessible and then place brick in the floor,” said museum board president, Jim Love. However, arguably the spring season highlight for the museum board is the potential of adding a passenger car which once belonged to a circus to the museum collection. Love said the board is waiting to purchase the car and guessed it might take around three months to get to the museum. The board anticipates to make the passenger car into a meeting room with a warming oven and cooling unit for catering and would like to rent it out to individuals who like to have parties or meetings. The car is planned to sit on museum track right beside the station. The car is a model from 1949 and is stainless steel. Board members feel the car is still “railworthy” and able to travel. It weighs around 95,000 pounds with its trucks being around 5 tons a piece. Board members plan to transport the car by placing rubber wheels on it and pulling it as a tractor trailer rig. Love said on the corner of Third Avenue and Sycamore Street, railroad track was hidden underneath a gravel lot leftover from several years ago. The board and volunteers recently dug up 99 feet of track and it was donated to the museum by Matt Willis with Jay Meyers Excavating having helped remove the track Thursday. Within the next month, Love said the board would ideally like to power wash the interior of the museum building to clear out any remaining bird excrement. Recently, the Ohio General Assembly passed its capital budget bill which, if signed by Gov. John Kasich, would bring a few hundred thousand dollars to Gallia projects. Among those approved include $125,000 to head to the museum’s rehabilitation efforts. Love first approached Gallipolis City Commission about turning the aging station into a museum in April 2016. According to him, the station was an old freight house and built in 1901 by Hocking Valley, a rail company of the time. The building at the time was considered 115 years old and Love had once served as the building’s telegrapher. https://www.mydailytribune.com/wp-content/uploads/sites/42/2018/03/web1_DSC_0155.jpgJim Posey lowers a caboose last summer onto the waiting trucks. Museum Board Vice-President Jerry Davis displays some original Nelsonville Star Brick the museum intends to use to pave its walkways. Volunteers prepare the gravel bed for rails in 2017. The Gallipolis Railroad Freight Station Museum sits quietly under snow as the sun sets on town in January. Jim Posey lowers a caboose last summer onto the waiting trucks. Gallipolis Freight Station Museum Board President Jim Love (left) adjusts a railroad tie as Thomas Cook of Feed Stop volunteers his time as he places rails for a track taken off the back of a semi with a fork lift in February of 2017.
https://www.mydailytribune.com/wp-content/uploads/sites/42/2018/03/web1_DSC_0518.jpgThe Gallipolis Railroad Freight Station Museum sits quietly under snow as the sun sets on town in January. Museum Board Vice-President Jerry Davis displays some original Nelsonville Star Brick the museum intends to use to pave its walkways. Volunteers prepare the gravel bed for rails in 2017. The Gallipolis Railroad Freight Station Museum sits quietly under snow as the sun sets on town in January. Jim Posey lowers a caboose last summer onto the waiting trucks. 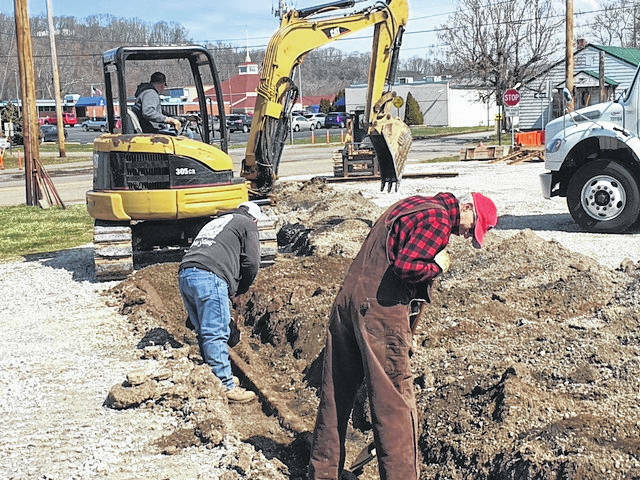 Gallipolis Freight Station Museum Board President Jim Love (left) adjusts a railroad tie as Thomas Cook of Feed Stop volunteers his time as he places rails for a track taken off the back of a semi with a fork lift in February of 2017.
https://www.mydailytribune.com/wp-content/uploads/sites/42/2018/03/web1_DSC_0545.jpgGallipolis Freight Station Museum Board President Jim Love (left) adjusts a railroad tie as Thomas Cook of Feed Stop volunteers his time as he places rails for a track taken off the back of a semi with a fork lift in February of 2017. Museum Board Vice-President Jerry Davis displays some original Nelsonville Star Brick the museum intends to use to pave its walkways. Volunteers prepare the gravel bed for rails in 2017. The Gallipolis Railroad Freight Station Museum sits quietly under snow as the sun sets on town in January. Jim Posey lowers a caboose last summer onto the waiting trucks. Gallipolis Freight Station Museum Board President Jim Love (left) adjusts a railroad tie as Thomas Cook of Feed Stop volunteers his time as he places rails for a track taken off the back of a semi with a fork lift in February of 2017.
https://www.mydailytribune.com/wp-content/uploads/sites/42/2018/03/web1_DSC_0857.jpgVolunteers prepare the gravel bed for rails in 2017. Museum Board Vice-President Jerry Davis displays some original Nelsonville Star Brick the museum intends to use to pave its walkways. Volunteers prepare the gravel bed for rails in 2017. The Gallipolis Railroad Freight Station Museum sits quietly under snow as the sun sets on town in January. Jim Posey lowers a caboose last summer onto the waiting trucks. Gallipolis Freight Station Museum Board President Jim Love (left) adjusts a railroad tie as Thomas Cook of Feed Stop volunteers his time as he places rails for a track taken off the back of a semi with a fork lift in February of 2017.
https://www.mydailytribune.com/wp-content/uploads/sites/42/2018/03/web1_DSC_0887.jpgMuseum Board Vice-President Jerry Davis displays some original Nelsonville Star Brick the museum intends to use to pave its walkways. 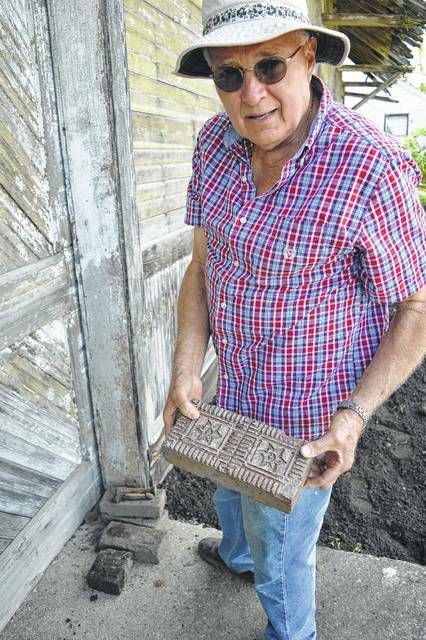 Museum Board Vice-President Jerry Davis displays some original Nelsonville Star Brick the museum intends to use to pave its walkways. Volunteers prepare the gravel bed for rails in 2017. 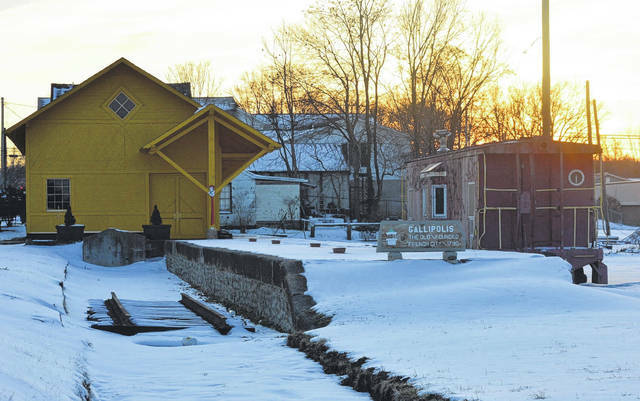 The Gallipolis Railroad Freight Station Museum sits quietly under snow as the sun sets on town in January. Jim Posey lowers a caboose last summer onto the waiting trucks. 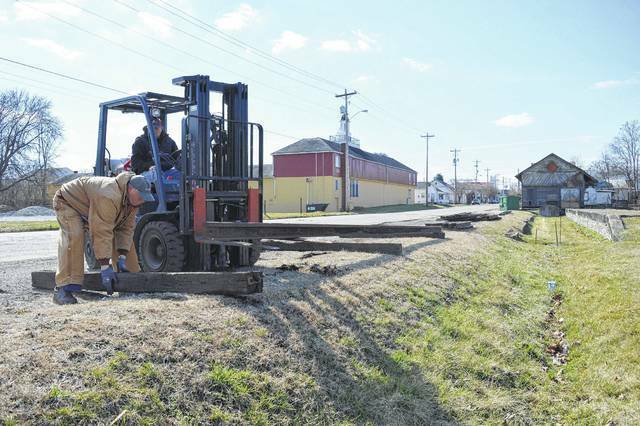 Gallipolis Freight Station Museum Board President Jim Love (left) adjusts a railroad tie as Thomas Cook of Feed Stop volunteers his time as he places rails for a track taken off the back of a semi with a fork lift in February of 2017.